Today may be Samsung Galaxy Note 8 day, but Samsung isn't done revealing new hardware in 2017, not by a long shot. DJ Koh, the tech giant's head of mobile, confirmed to CNBC that Samsung will launch a new Gear S smartwatch at IFA 2017, one that would likely be called the Gear S4. Samsung has an August 30 event planned for the massive consumer electronics show, going down in Berlin, Germany – as it does every year. Samsung launched the Gear S3 at IFA 2016, so a next-generation reveal at this year's show makes sense. 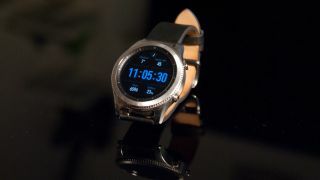 Koh offered no further details on the device, though he made additional comments suggesting the new Gear S might put a premium on providing comprehensive health information to users. While the CNBC report doesn't mention other Samsung wearables launching next week, leaks strongly suggest the Galaxy S8 maker is also preparing a new fitness tracker called the Gear Fit 2 Pro. The tracker is said to be fit for swimming. The latest slip happened earlier today when Samsung apparently set a web page for the Gear Fit 2 Pro live, as spotted by prolific leaker Evan Blass, before taking the page down. Even if Samsung only reveals the Gear S4 (let's face it, the Gear Fit 2 Pro sounds like a sure bet at this point), it will come mere weeks before the Apple Watch 3 is likely unveiled. The third-generation Apple Watch may be announced alongside the iPhone 8, iPhone 7S and iPhone 7S Plus during an event in September. Some suggest the smartwatch, which will come in an LTE model, might get its own launch event at a later date, but we're leaning towards Apple unveiling all its new hardware in one fell swoop. This could set up two top wearable makers on a collision course leading into the end of the year. Whatever Samsung has cooking, we'll find out in exactly one week. TechRadar will be on the ground at IFA, bringing you all the latest.